I wasn’t planning on posting another stew so quickly, but I awoke this morning to snow and I figured writing about birthday cake or cheese straws can come later (hint, hint!). It’s funny because I didn’t expect snow as I was still riding high on my week-long sunshine, or at least that’s what my weather app was telling me. No more blue skies and sunshine. Instead, the ground is white and the sky is a few shades greyer. But I’m okay with it as it’s awful pretty outside and despite Vancouver not being known for snow, it’s the second snowfall we’ve had already this winter. It’s a novelty. 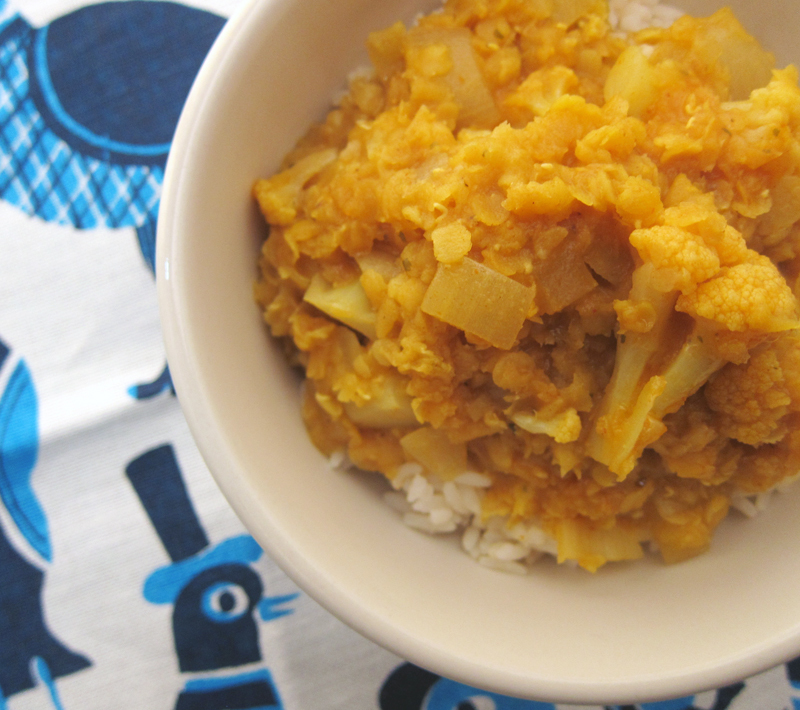 A simple vegetarian curry, however, is more of a staple in our house. I’ve made plenty over the life of this blog and I often make a curry at least once a month or more in the fall and winter. I realized I haven’t posted any recently. In fact, the last curry I posted was this tomato-apple dal last January so I figured it’s about time for something new. This cauliflower and red lentil version is a good one. It’s one of those thrifty, one-pot meals that is big on flavour and welcoming on a cold night. It’s comfort food in that it’s healthy and when it’s simmering away on the stove, it fills the house with a heady, belly-rumbling scent. Plus, it makes use of ingredients you probably already have in your cupboard. What’s not to love? Instead of using a homemade vegetable stock, I added water to the few tablespoons left in my jar of store-bought marinara sauce and gave it a good shake for a tomato-y flavoured water. It worked well and stained my curry a lovely tomato red! Making do with what I’ve got! In a large pot, melt the coconut oil over medium-high heat. Stir in the onions, garlic, ginger, carrot and chili flakes and let soften for a few minutes, stirring around a bit. Spoon in the curry paste, along with the rinsed red lentils, giving things a good mix. Pour in the stock, bring to a boil and then reduce heat to medium-low, add in the cauliflower and cover. Simmer for 20-25 minutes until lentils are mushy and cauliflower is tender, adding more stock or water if you feel it needs it. Remove from heat, squeeze in lemon juice and adjust seasoning by adding a bit of salt and pepper. Serve over rice or your favorite grain. I love a curry/stew like this! Simple and flavorful, plus lentils and cauliflower are two of my favorite things to eat. I also love how economical this is – something I sorely need this time of year. Thanks for sharing this! Who doesn’t love a warming bowl of starchy, hearty, spicy goodness on a cold day? I know I do! But it is HOT where I am at the moment. So I might file this one away for the winter. I had a head of cauliflower in my fridge and was debating which of your cauliflower recipes to re-create, this one or the sumac one. In the end, I chose sumac with cauliflower because I’ve been desperately searching for sumac for almost a year and finally found it in Montreal at the Jean Talon market. I will certainly return to this delicious looking recipe soon, as I love both cauliflower and red lentils! Yum! Thanks Shannon, it’s a good economical meal – perfect for January! Joanne, yes, glad you found sumac! Now I’m totally missing Montreal and the JT Market 🙂 That roasted cauliflower recipe is a good one, I hope you love it. Mmm I definitely consider curry to be comfort food and I”m loving the sound of this especially since I always seem to have red lentils on hand! This looks yummy! And I finally found red lentils at a local Indian grocery store. I like the Patak brand too but have trouble finding it locally. I may resort to Amazon. 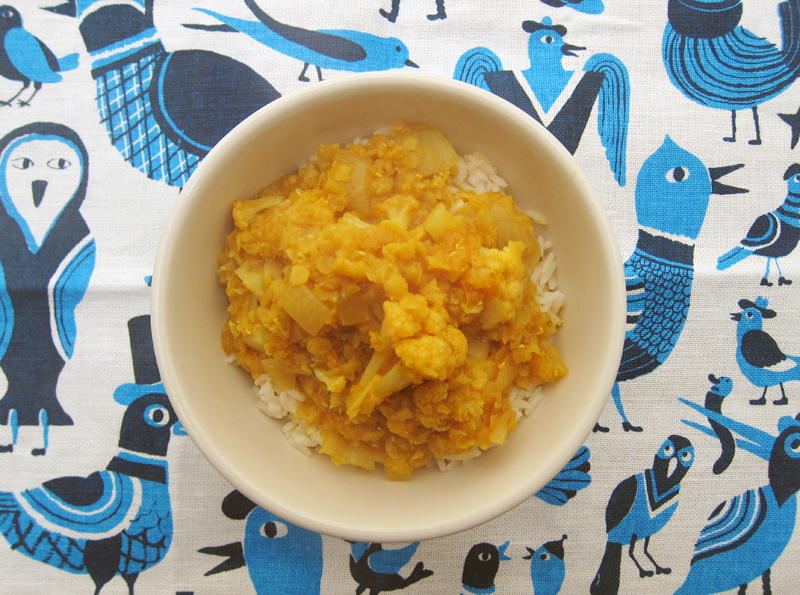 I love the idea of cauliflower curry and so want to try this one! I’ve never thought of combining cauliflower and lentils in a curry. Being South-East Asian, this is intriguing for me. Must try! Bijoux, I totes understand. Completely. Joanne, the red lentils & the cauliflower go well together! Hooray simple comfort food. RMW, enjoy, it’s a keeper! Sues, I think you’ll love this. Enjoy. Try it, NT, I hope you like it. I served this over brown rice, it was maybe 30 minutes of effort and 1 hour total cooking time from start to finish. The red lentils add a nice body to the dish and they cook quickly. I added 50% more curry paste, but I think that’s because I had a more mellow mix. Adding your lemon at the end brightens the flavor; I used zero salt and didn’t miss it. Also, I had dismissed coconut oil in the past because it is 90% saturated fat, but various articles on the web are leading me to question that logic, so I used it to make this dish. Still, the general consensus of the medical community seems to be that we should limit our intake of saturated fat. What’s your take on this? Robert, glad to hear you enjoyed this curry. I love red lentils because they cook so quickly and make the dish that much more filling. As for your coconut oil question, I’m a bit confused too. I remember it being demonized and now it’s touted as a health food. I’ve read a lot on it & I’m still not sure, but I think anything in moderation is generally okay (I love butter! ), but I’m not as health-conscious as I probably should be. I just made this dish. I had to make it a little different to match my kitchen stock. I think it’s a little bit too spicy, instead of the chili flakes, i removed the seeds from 2 dry chilis and added then. I also had to replace the coconut oil by olive oil… i image it’s makes a huge difference. And another major diference, curry powder by curry paste. Wow, Pedro, so many changes 🙂 Hope it turned out well. I think the biggest difference is the type of lentil used. The red ones turn to mush and get very soft, while the green ones hold their shape. Thanks for sharing! Quick and easy, healthy and full of flavor….used olive oil and added curry powder…and I confess, a pat of butter in my bowl! Perfect.